Ridiculous. Absurd. Preposterous. All three of these adjectives could be used to describe the plot of the new caper film MAN ON A LEDGE. Which just goes to prove that plot isn't everything when it comes to the movies, because as silly and implausible as this film gets, it's never anything less than entertaining. Said plot concerns honest cop Nick Cassidy (Sam Worthington) being framed for stealing a really big diamond from evil rich guy David Englander (Ed Harris). While on leave from prison to attend his father's funeral, Nick manages a daring escape. 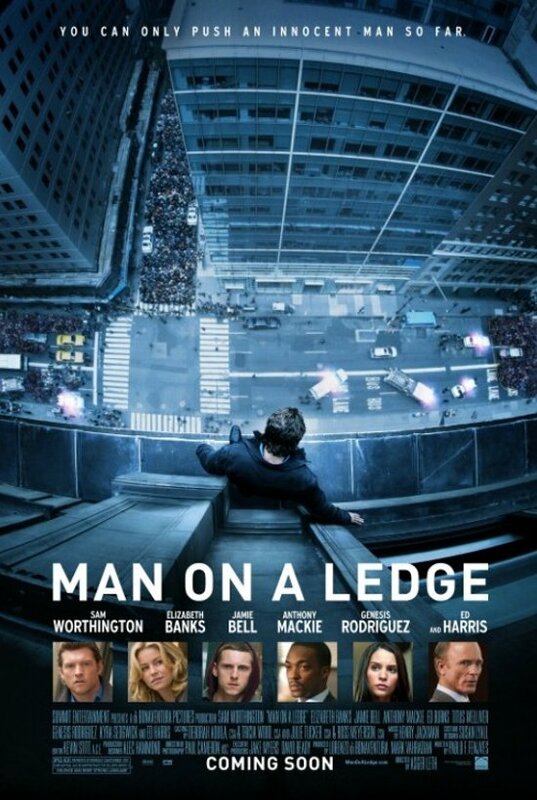 Once free, he sets in motion a convoluted plan to prove his innocence that involves standing on a ledge and threatening to jump. A police negotiator played by Edward Burns arrives, but Nick refuses to talk to anyone except Lydia Mercer (Elizabeth Banks) who is on the outs with the force for failing to talk a cop out of jumping off a bridge on her last assignment. Meanwhile, Nick's brother Joey (Jamie Bell) and Joey's girlfriend Angie (Génesis Rodríguez) are breaking into Englander's building hoping to steal the diamond that Nick supposedly stole, but which they are certain is still there. Not only are there a lot of assumptions inherent in Nick's plan, but the people carrying it out have almost no experience at this sort of thing. Angie's main qualification seems to be her cleavage (which the camera lingers on a great deal), although she does mention that she broke into a few houses when she was younger. But never mind all that. These two should have no problem breaking into an office building equipped with state of the art security and alarm systems. Adding further tension to the proceedings is the fact that there are some dirty cops who helped put the frame on Nick, possibly including his former partner Mike (Anthony Mackie), and an unscrupulous TV reporter played by Kyra Sedgwick who isn't above putting people in danger to get a good story. Despite a screenplay littered with clichés, plotholes, and implausibilities, director Asger Leth manages to infuse this material with an undeniable energy and sense of fun. He keeps the tension high, and regardless of how unbelievable it may be, the heist portion of the movie is great. Leth also knows better than to take this movie seriously, and so does the cast who all swing for the fences in every scene. I'm not saying the acting is good, but the performances connect, even if it's on a campy level. 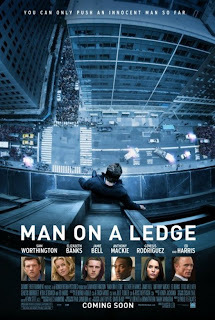 There's no doubt that MAN ON A LEDGE is a schlocky B movie, but I'd be lying if I said I didn't enjoy myself while watching it. I'm not the kind of person who can goes in for “leave your brain at the door” kind of movies, but if I go into a dumb film with my brain firmly attached and something about the movie clicks with me to the point I'm willing to at least dial my IQ down a few points, I'm cool with that. I also realize that for some people, even that is conceding to much to a film, and if you're the sort who cares strongly about things like believability and general intelligence in a film, this isn't for you. 2 1/2 out of 4 stars.